Travel Notice: Heavy rains are expected in the Santa Cruz mountains on Tuesday 2/26, and highway CA-17 from San Jose to Santa Cruz can be very dangerous in heavy rains. Please drive carefully if you plan to take that route. Also, if you’re coming from SFO, consider taking an alternate route: CA-92 to CA-1. From SJC or OAK, consider an alternate route of highway US-101 to CA-129 to CA-1. Important Information Please note that the Dream Inn is now sold out for the first two nights (Tuesday and Wednesday) with rooms still available for Thursday and Friday nights. However, for Tuesday and Wednesday nights, we were able to secure rooms at the Beach Street Inn (only a short walk away from the Dream Inn). For ACM HotMobile attendees, the Beach Street Inn is offering discounted rooms with ocean view at $179/night and without a view at $159/night. Bookings can only be made by telephone at: +1 831 423 3031. Rooms at the Dream Inn have been reserved at a discount rate of $179 per night (same price for single and double rooms), for the workshop week (26 - 28 Feb) and at $209 for one additional night (28 Feb - 1 Mar). Please, use the web link bellow to book a room for the workshop, or call the toll free phone number, quoting the reservation code. Please note that the number of discounted rooms is limited. We recommend to book rooms as soon as possible. ACM HotMobile 2019 is located in Santa Cruz, California — about a 40 minute drive from San Jose International Airport (SJC), a 1 hour and 15 minute drive from San Francisco International Airport (SFO), and a 1 hour drive from Oakland International Airport (OAK). 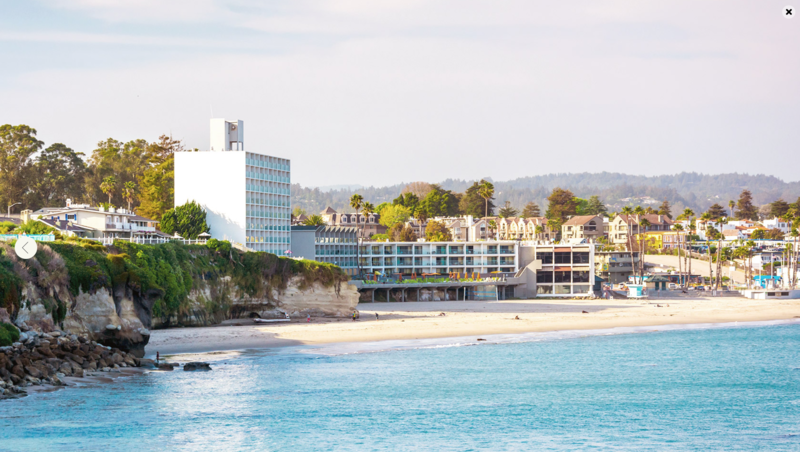 For travel details on how to get to Santa Cruz and to the hotel, please visit the hotel website at: https://www.dreaminnsantacruz.com/santa-cruz/getting-here. The Santa Cruz Airport Flyer (http://www.santacruzflyer.com) offers shuttle service between Santa Cruz and SJC and SFO airports. Shuttle reservations are required. Include a fax number or email address of where we can send the letter. Travel support will provide up to $800 per domestic student and up to $1,500 per international student to help cover the cost of the student's travel. Although student authors of HotMobile 2019 papers who are also presenting posters will be given priority for travel awards, we will seriously consider applications from presenters of solely posters and demos, as well as students who have not previously attended HotMobile and do not have a presentation/poster/etc. We strongly encourage the participation from women, underrepresented minorities, and persons with disabilities. Some of the awardees will be selected to play visible roles in the organization and running of ACM HotMobile 2019, including registration desk duties and/or writing and publishing a workshop summary. Applications for the travel award should be sent electronically as a PDF attachment to the HotMobile 2019 Student Travel Grant Chair, Felix Xiaozhu Lin at hotmobile19travel@gmail.com by the deadline. The subject line of the email should be: HotMobile 2019 Travel Grant Application. Please make sure that you receive an electronic confirmation of your submission. An application should consist of the following in one single PDF file: the student's CV, a short personal statement (maximum one page), and a supporting letter from the student's advisor. Type of participation at HotMobile 2019 (e.g., poster/demo presenter, paper presenter, etc.). A description of areas reflected in the HotMobile 2019 program that would impact the student's research. Confirmation that the student is a Ph.D. candidate in good standing. The suitability of HotMobile 2019 program to the student's research area. Ways in which attending the workshop would benefit the particular student. The financial needs of the student in traveling to HotMobile 2019. Applications will be reviewed by the HotMobile Travel Awards Committee, and the awards will be announced prior to the workshop. Please note that the reimbursement amount will be subject to change based on the number of awardees. Eligible expenses for reimbursement include advance student registration, hotel, and air travel. Expenses that are not eligible for reimbursement include regular and/or on-site registration, meals, and local transportation (taxis, shuttles, parking, etc.). Student travel grants are available in the form of reimbursements that are sent after the completion of the conference and receipt of all required documentation and receipts.. Note: due to recent US government shutdown, the processing of reimbursement for US students will happen AFTER the government reopens. For any questions, please contact the HotMobile 2019 Student Travel Grant Chair at hotmobile19travel@gmail.com.